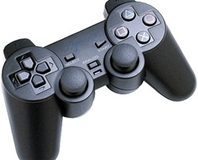 A new medical study has uncovered a brand new disease which seems to affect gamers, dubbed PlayStation palmar hidradenitis. Commodore is back in the game! CEBIT 2007: The Commodore brand is back as gaming PC's, with some customisable cases, fantastic attention to detail and old school gaming at heart. Do you carry a lot of technology around with you? Got a hefty commute or a regular flight schedule? Take a look at these ultra-chic cases, they might be just the thing you've been longing for. When Vivendi Universal wanted a custom case created on a tight time scale to promote their latest mega-hit, F.E.A.R. , they came to us. Take a walk through the creation of the custom case. These textile Shuffle cases are perfect for personalising your Shuffle. They come with added Marxism, too.